Vienna is a 24-hour watch. 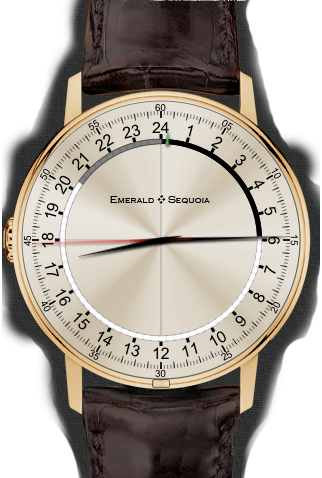 The hour dial is marked with 24 hours instead of the usual 12 and the hour hand makes just one revolution per day. The minute hand makes one revolution per hour as usual. Noon is on the top on the front side. Unlike traditional 24-hour watches, Vienna's black and white ring shows the actual daylight hours for this locale. And the gray zone indicates the nighttime hours when the Moon is up. 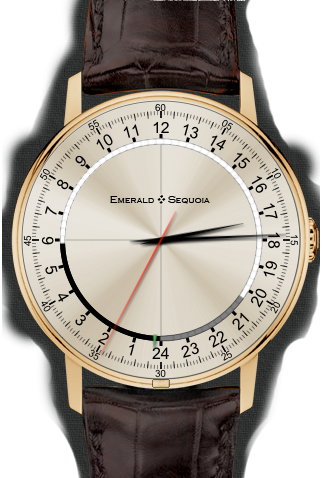 The small green hand shows the UTC time. In Set mode, the upper pusher advances one day; the lower one advances one hour. To see an animation of the changing length of the day press and hold the day button; be patient, it's not very fast (except at high latitudes). Sidestepping the Great 12-on-Top vs 24-on-Top Debate, the back has midnight on top (but is otherwise identical to the front).